Wow it looks like Terry is about to kiss Arlene's neck. Guess Arlene has gotten over her terrible choice of Rene. Sam and Maryann had a history together and Maryann is sure to haunt Sam about it as much as possible. It looks like Sookie is getting off a private plane in this upcoming episode of True Blood. Is this her arriving in Dallas? Eric makes a delicious offer of his blood to Lafayette, or so we assume, in this upcoming episode of True Blood. 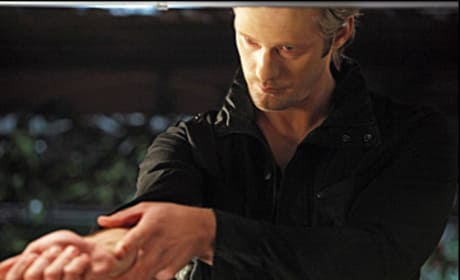 Jason and Sarah Newline seem to have ended up too close as Jason is buttoning up his shirt in this scene from an upcoming episode of True Blood.